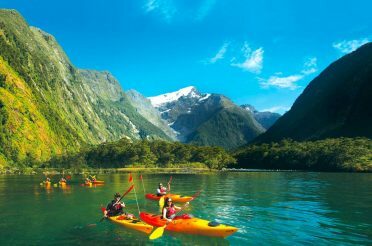 Take one of these kayak tours among natural environments in New Zealand and you’ll discover much more than stunning scenery and peaceful surroundings. 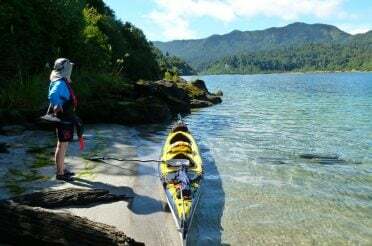 The kayak nature tours around New Zealand presented here also let you meet some of New Zealand’s cutest and rarest little critters. 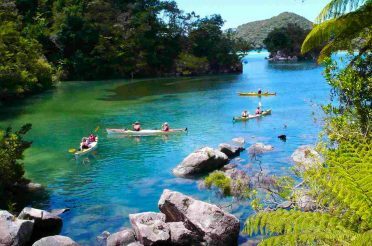 Beautiful, native flora and fauna is something that sets New Zealand kayaking tours apart from others anyway. But these places take it to the next level by providing the opportunity to see New Zealand’s rare, endangered and unique native animals up close and personal. 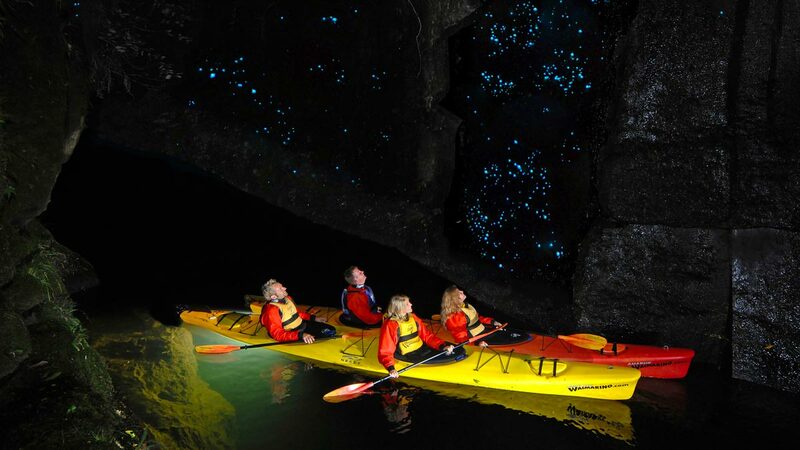 Spend a night with kiwis, paddle around with penguins, enjoy the chorus song of bats, and marvel at glowworms twinkling under a starry sky on the best kayak nature tours in New Zealand. Glow worms can be encountered in several places around New Zealand. You can kayak just about anywhere in the world. But there’s only one place you can do both at once – beautiful Lake Mclaren, just 20km outside of Tauranga. 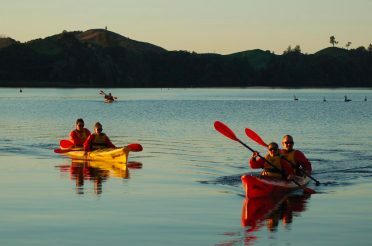 Waimarino Kayak Tours put on their unforgettable evening kayak tour all year round. You begin with a drink and nibble – local, award-winning Mills Reef wine, New Zealand cheeses and homemade mulled wine (during the winter) are all provided, along with head torches and all the gear you need for kayaking in the dark – on the waterfront, watching the sunset dip into gorgeous Lake Mclaren. Then, experienced guides will lead you in the twilight to the top of the lake, where the famous fungus gnat (New Zealand glow worms) live on the sides of a narrow, open-top canyon, not a cave like in other areas of the North Island. Anybody over 8 years of age with a reasonable level of fitness can do it, but no experience kayaking in the dark is required. Kayak back under a wide night sky and count the stars. It’s truly a special place, with stunning natural beauty in every direction. The whole nature kayak tour takes about 3 and a half hours, but you’re sure to remember it for a million times longer than that. We’ve covered the incredible, largely untouched natural beauty of Doubtful Sound in our Hidden Kayaking Gems in New Zealand’s South Island blogpost. In case that didn’t already convince you to choose this South Island gem for a kayak nature tour in stunning natural surroundings, here’s four more reasons that might just do so: dolphins, penguins, seals, and birds. Far less touched by human hands and habitation than its more famous brother, Milford Sound, Doubtful Sound is a heaven for native New Zealand flora and fauna to thrive. 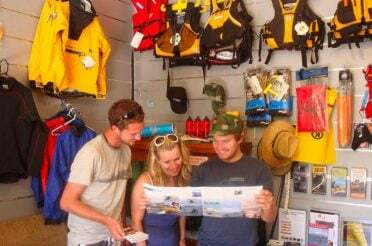 Doubtful Sound Kayak offer the most comprehensive full-day tour. You can begin at Manapouri or Te Anau in the morning, from where you’ll enjoy breathtaking natural scenery every single second until you return in the evening. 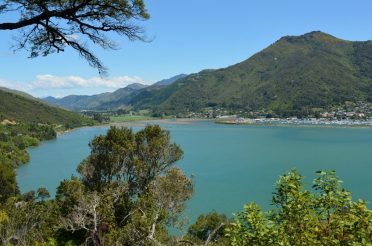 Beautiful natural scenery around Lake Manapouri includes sandy beach coves, native forested islands and dramatic mountains. Get a rundown on the local flora, fauna and history from your guide before hopping in stable double kayaks and venturing into Hall Arm until you reach the shadow of staggering Mt. Danae, 1500 metres high. 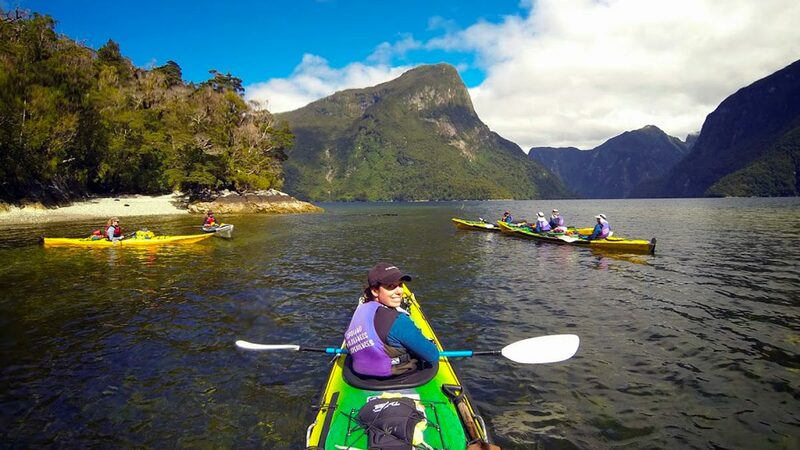 In addition to seals, penguins and dolphins who will share the water with you, on this Doubtful Sound nature kayak tour you’re also bound to get up close and personal with New Zealand’s cheeky, incredibly intelligent (and, for some people, car-rubber-stealing) native Kea bird. Our precious Te Hoiere (Pelorus river) is home to gorgeous scenery, unique rock formations, native bush and a filming location used by Sir Peter Jackson in The Hobbit: The Desolation of Smaug. But it’s even more precious a place for some of its special animal residents: native long-tailed bats. Bats are the only native land mammals left in New Zealand. Pekapeka, as they are called in Te Reo, feature in Māori legends, usually as omens of doom and death. 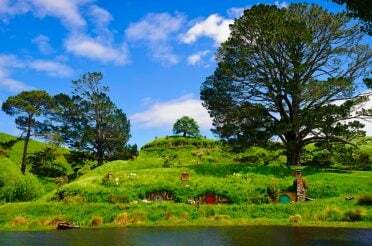 You needn’t be scared of the cute little creatures you can see on the Hobbit Kayak Tour from Pelorus Eco Adventures. At last count, the population of long-tailed bats in the area around Pelorus Bridge sits at 38. NZ Forest & Bird have installed bat detectors to keep tabs on the local population, and you’ll notice these detectors on all nature kayak tours. For real nature lovers, summer is the time to do the tour. Between November and February every year, you can easily view the bats in their natural environment at Pelorus Bridge. The Pelorus Eco Adventures guides are well clued up on information about these special bats, as well as other native New Zealand birds, trees and animals. 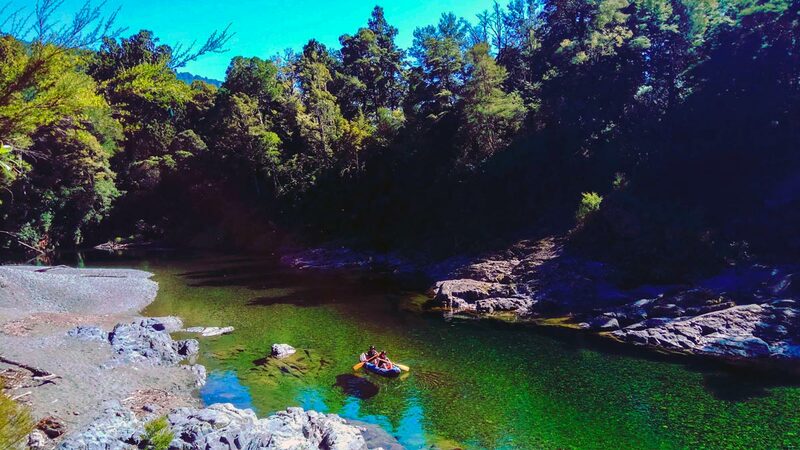 Read more about what you might see in our blog post dedicated to the topic of Flora and Fauna on the Pelorus River, New Zealand. New Zealand has no shortage of impressive animals, but one is utterly unique. The tuatara is endemic rather than native to New Zealand – but that’s only because it’s probably been around longer than New Zealand itself. The two species of tuatara are the only remaining reptiles from the Sphenodontia order of dinosaurs, which dates back over 200 million years. They used to live across both of New Zealand’s main islands, but were wiped out there by Polynesian kiore rats, well before European settlers (and their own invasive Norwegian rats) arrived. Now, tuatara live only on a small scattering of islands, many of which have been set up as native nature reserves by the Department of Conservation after years of dilligent pest-eradication. Good news for anybody planning a kayak nature tour in New Zealand – one of those islands doubles as an awesome kayaking location! 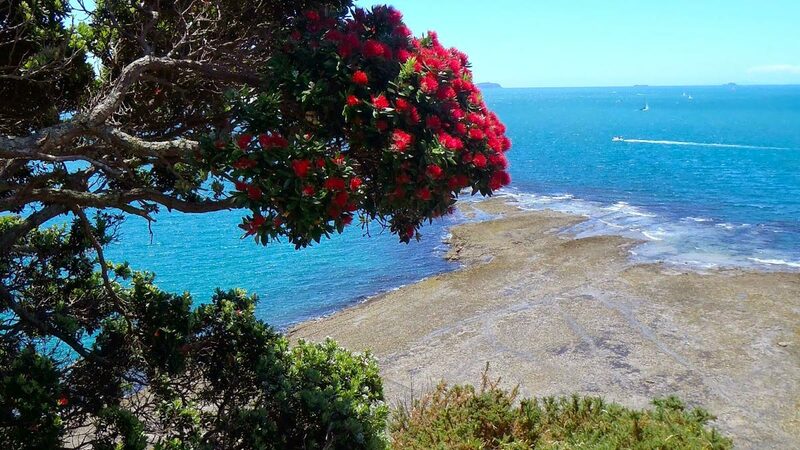 Motuihe Island sits in the Hauraki Gulf, near Auckland. 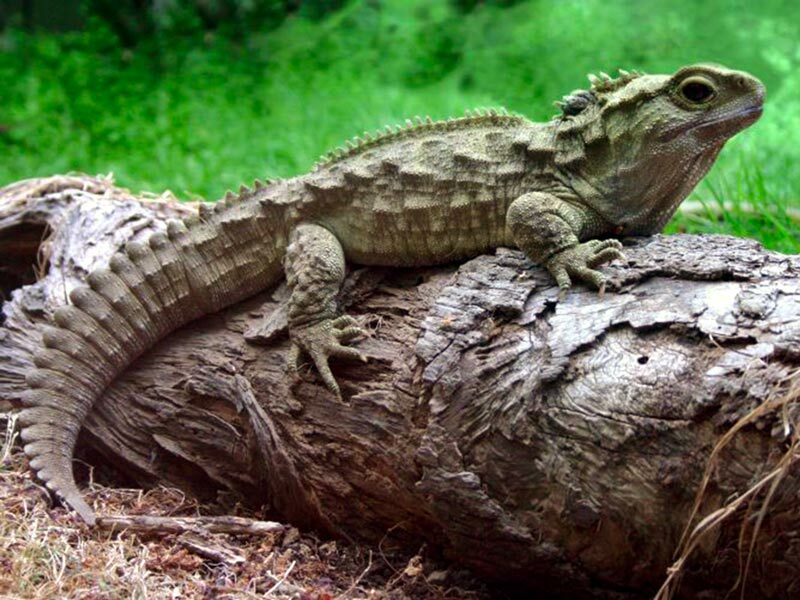 Since 2012 it has been home to about 60 tuatara reptiles, who were relocated there from other pest-prone islands once Motuihe was deemed safe for them. You will get the chance to see these tuatara during the awesome overnight island hopping tour offered by Auckland Sea Kayaks. During this tour, you get to camp overnight on the island. 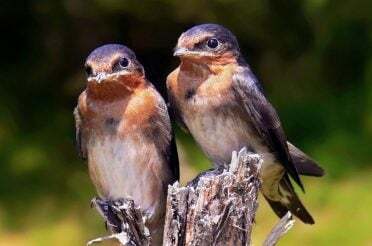 Nocturnal kiwis also live on Motuihe island, and in the morning you’ll be able to explore a bit and hopefully meet some more of its endangered inhabitants: New Zealand dotterel, saddleback, kakariki, bellbirds, shore skinks and more rare native birds.